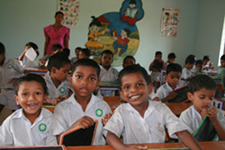 As of April 2008, there are now three primary classes at the Hariharananda Balashram Residential School, located in a rural area of Orissa, India. Since Hariharananda Balashram is an English medium school, with all classes being taught in English, the demands for the students to be proficient in English are growing. To better assist the students in this regard, the Indian teaching staff and caretakers are also in need of increasing their level of spoken English. 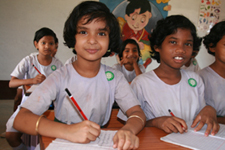 Our partner organisation, Prajnana Mission, in Cuttack is therefore looking for an English native speaker who would live, for a period of time, together with the six female Balashram teachers to help them improve, qualitatively, their professional teaching duties and responsibilities through supportive instruction. The trainer would help identify and improve the language deficiencies in English grammar, vocabulary, and conversation through informal, but goal-orientated, conversational training, during their daily activities. This seva (selfless service) opportunity would start after July 2008, with a minimum stay of six weeks. 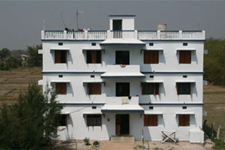 Hariharananda Balashram is located in a beautiful remote area. Thus, those interested must be comfortable living in a quiet and secluded area. The English trainer would live in the staff quarters of the Balashram campus with the teaching staff, and would be involved with the school activities and be in direct contact with the children. Accommodation and three vegetarian meals per day will be provided. and more detailed information will be sent to you.